The word aesthetic is used to talk about art, beauty, the study of beauty, and the appreciation of beautiful things. If someone is an aficionado of something, he likes it and knows a lot about it, and thus is a true fan. Your avocation is an activity, such as a hobby, that you do because you are interested in it. A dilettante is someone who frequently pursues an interest in a subject, but never spends the time and effort to study it thoroughly to master it. A hallmark is a symbol, badge, or emblem of something, such as success. A perfunctory action is done with little care or interest and only because it is expected of you. A quack is someone who pretends to be qualified to do something, but really is not. The lecture series and panel discussion on climate change gave Wilma the perfect chance to show off her bailiwick of weather-related expertise. As Wilma consulted with other specialists in the field, they became more and more impressed by her bailiwick, which was brimming with knowledge. It soon became known that she was an authority in the professional area or bailiwick of environmental studies. Quiz: Try again! What is a bailiwick? An opportunity to share knowledge. An area or sphere of learning and skill. A meeting of like minds. A bailiwick is a person’s sphere of knowledge or learned skill. Proud Mama Praises her Bailey "My Bailey is a wonderfully wicked wick lighter," said Mama McKay to her friend Claudia. "He may not be great at anything else, but his bailiwick of lighting candles is better than nothing, don't you think? I mean, some people's children can't do anything at all!" "Oh, yes," agreed Claudia, "I've always said that your Bailey is a darn good wick lighter!" 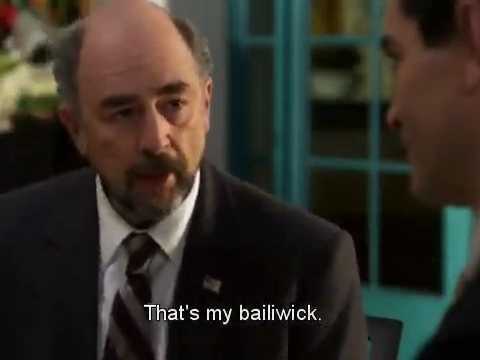 A bailliwik was a “town bailiff;” just as a “bailiff” oversees a “neighborhood or block of houses in a town,” so too is one’s bailiwick a supervisory area or field of expertise. The Cape Since Patrick's bailiwick is the ports, he should be a part of this conversation.